FLS Plastics - Fascia/Soffits/Guttering based in Brandon, Suffolk. Taking care of your guttering can save you time and money in the long run by helping to prevent staining and damage to the exterior of your building and structural damage caused by damp. 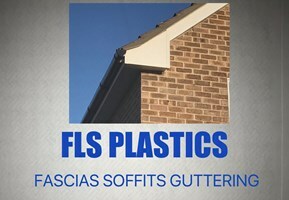 Based in Brandon, **FLS Plastics** is a trusted and reliable fascia, soffits and guttering specialist. Guttering, fascias and soffits are frequently overlooked. However, their purpose is much more than cosmetic. Guttering is vital to redirect run-off from your roof which is an average of 500 gallons for an inch of rainfall! Without effective guttering this water can run down the exterior of your property damaging the walls, windows and doors and causing staining. If water isn't properly drained away it can sit at the base of your property, seeping into the foundations and causing damp. **FLS Plastics** is on hand to clean, repair and install new guttering to make sure your property looks good and is protected from rain.